After a very long hiatus, we're finally getting back into having some "fun stuff with Mommy" (at least that's what the kids call it). 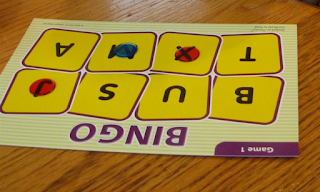 While doing some organizing, I ran across the Hooked on Phonics sets (Letter Names and Letter Sounds) I picked up for a steal at a garage sale a few years back. I had intended to use them with Pinky, but they were a bit too young for her. I packed them away for Chaos and completely forgot about them. 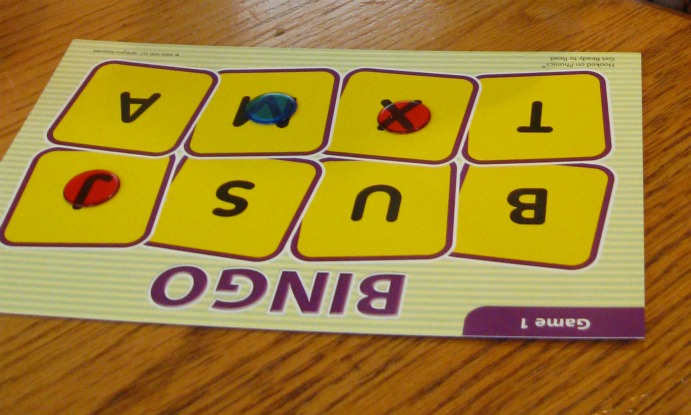 We've been having a lot of fun reviving our Letter of the Week and adding in Hooked on Phonics. 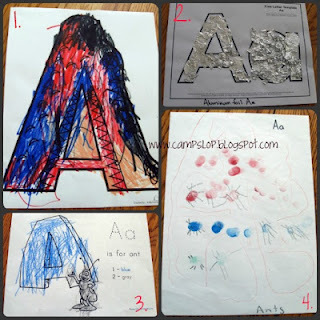 We started this week with a review of the letter A. We added our Alligator A (I posted about it here) to a new alphabet binder. 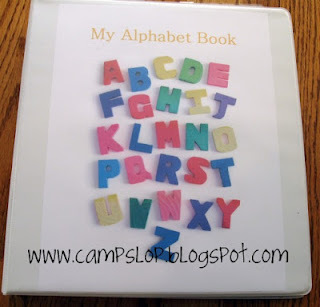 We're going to use this binder to keep track of all of our alphabet crafts. We used a simple 3 ring binder with sheet protectors inside. The front cover I created in Publisher and printed out. Chaos loves his book! One of Chaos's favorite things to do (at the moment) is to make crafts. So, following his lead, I aimed to make learning the letter A a crafty endeavor. 2. Tactile A (aluminum foil). The idea for this craft is here at The Active Toddler and the letter sheets were printed from Quality Kids Crafts. 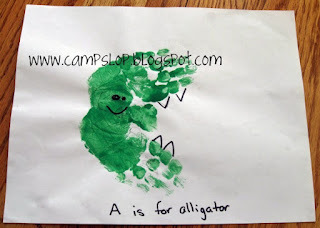 We also made a handprint alligator like the one in this post at Snails and Puppy Dog Tails. We jammed to the music on the Hooked on Phonics software while we made our crafts. Pinky and Chaos both seemed to love it despite there only being 2 different songs for each letter. We went on a letter scavenger hunt. Equipped with a picture of "A" and "a" Chaos went in search of the letters around the house. 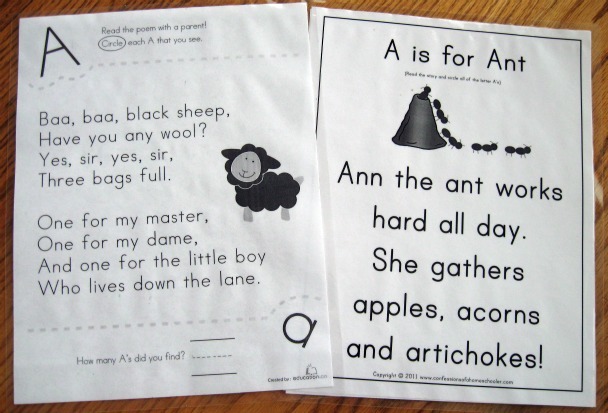 We kept track of which we found more - uppercase or lowercase (lowercase won in case you were wondering). 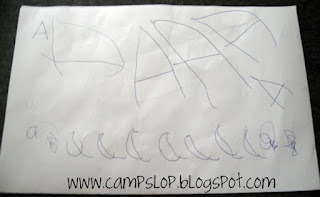 Chaos surprised me by wanting to write the letters that we found. He has just recently expressed interest in writing. 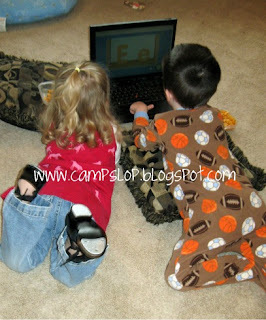 We checked out Starfall for some fun, online games (love that site!). 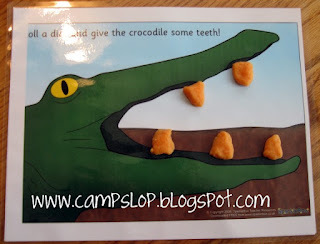 Inspired by this post at The Princess and the Tot and using the playdough mats we found Sparklebox, we added teeth to the "alligator" (he's really a crocodile, but we're okay with pretending). We did some letter hunts using the Letter Hunt worksheets from COAHS and the nursery rhyme pages from Education.com. I printed out the pages and laminated them so we could use them again. 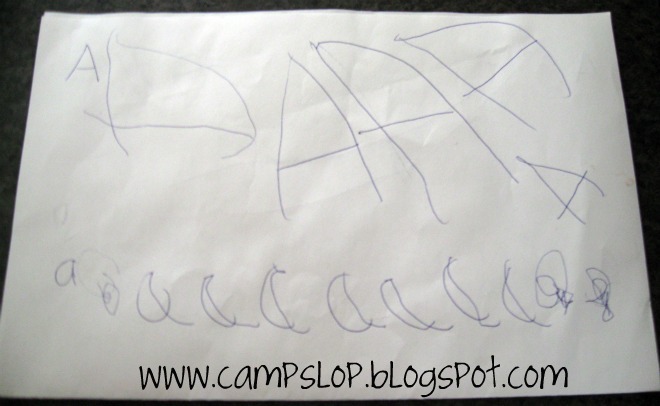 Instead of dry erase markers, Chaos used dry erase crayons . Finally, we played Ants in the Pants. Always a fun, classic game! Cute - I love the crocodile and teeth play dough mat!